Our C Series Microscopes offer an unreversed, upright image ideal for use in dissecting or examining gems, plants, insects, or virtually any three-dimensional specimen. 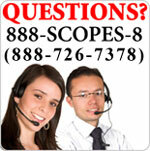 Precision optics provide a wide field of metal construction assures years of service at an economical price. The dual focusing knobs feature a rack and pinion mechanism and a special screw locks the head assembly in place to avoid refocusing. 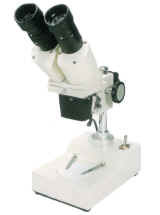 These microscopes can be useful in many industrial applications as well as for educational or hobby purposes. Versatile illumination system offers incident (top) lighting or transmitted (bottom) lighting through the frosted glass stage plate. You can also purchase extra objectives and swap them in and out! Incident (top) & transmitted (bottom) illumination each with 12V 10W Halogen lamp. Choice of objectives (slide-type) 1X, 2X, 3X or 4X. Power Supply: 115v/60hz. North American style power cord.